Based in Macclesfield, Cheshire, the specialist distribution business, has seen a 55% like for like sales uplift for the 1 January to 30 June 2015 six month period, in comparison with the same trading period in 2014. 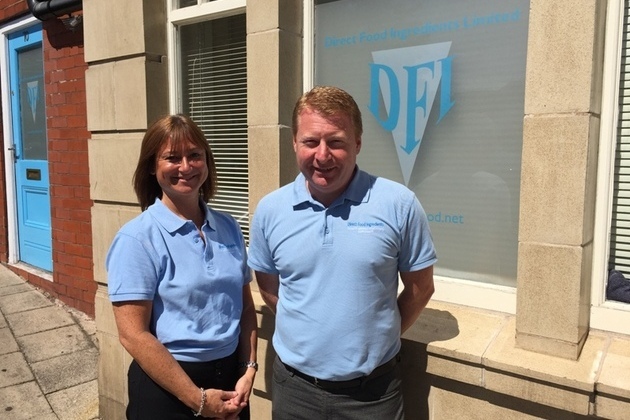 Direct Food Ingredients has announced a turnover of £6.88million for the last 6 months, demonstrating record growth for the business since it was established by the founding Director Steve Loake, nearly 20 years ago. Steve and his co-directors Cath Hough and Brigg Simpson have built a business which services the UKs largest food, nutraceuticals, soft drinks and pet food companies as part of its impressive blue-chip client base. Commenting on the business growth, Steve explains: “Over the past six years we have invested heavily in our infrastructure with new software systems, employee training & development, and with a significantly expanded product portfolio. “This investment has provided us with a firm base to offer an unparalleled level of customer service, and ensure quality and consistency of delivery. We have worked hard to become accredited by the most stringent of industry bodies. This is testament to our QA procedures and meticulously monitored supply chain which sees us regularly visit our factories overseas as part of our comprehensive audit trail. Direct Food Ingredients employs 16 staff and is located on Waters Green in the centre of Macclesfield. The business is an established leader in the importation, storage and distribution of functional foods, nutritional & sports ingredients and vitamin and mineral premixes.